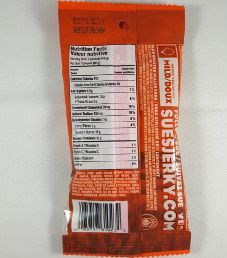 The next review for Sue’s Jerky will focus on a 1.4 ounce/40 gram bag of their slow roasted pulled pork flavoured jerky. This flavour is described as a tender BBQ classic with a smoky finish. The jerky was graciously submitted for review by the business development manager, Ivan Yuen. 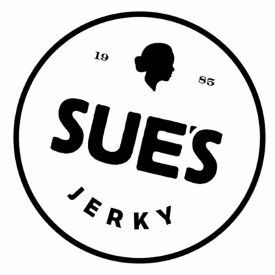 Sue first introduced her one-of-a-kind Sue’s Jerky to the world during Expo ’86 in Vancouver. Inspired by her travels, and family recipes from Southeast Asia, all of Sue’s Jerky is hand-prepared in Richmond, British Columbia. Sue’s passion for making great jerky comes through from selection of raw materials prepared to the perfect tenderness. Starting in Sue’s kitchen in 1985, Sue brings jerky back to the basics: hard work, classic family recipes, and quality ingredients. Marinated and dried to perfection, Sue has a passion in crafting healthy and delicious jerky. There are currently six delectable beef and pork jerky flavours available. The pork is not guaranteed to have at least partial free range access to roam about outside. As a result, the highest ingredient rating that can be awarded is a Very Good (9/10) rating. The liquid marinade is only comprised of a decent soy sauce. There are some healthy ingredients used such as tomato powder, spices, horseradish, onion powder, and garlic powder. The level of sugar is very high at near 9 grams of sugar per 28 grams of jerky. For a sweet based flavour as we have here, our preference is 5 grams of sugar or less per 28 grams of jerky. The salt level is decent at around 315mg of salt per 28 grams of jerky. This jerky does qualify to have no sodium nitrite, or any other similar unhealthy preservatives. Instead, the main preservative used is minimally processed sea salt. Commendably, there is no MSG added. 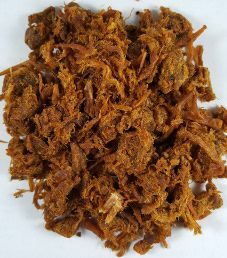 These strips or shavings of jerky are quite small in size, which resembles shredded pork. The texture is soft and tender, being easy to chew. There are no visible signs of fat, and handling this jerky leaves no oily residue on your fingers. 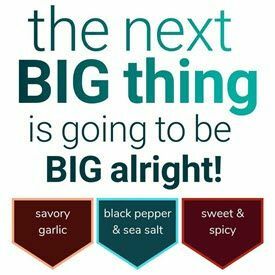 A pleasant, complex blend of spices is noticed first. There is a moderately strong sweetness present, which balances well, but is arguably too sweet tasting. The sweetness to a certain extent dilutes the natural beef flavour. The saltiness is at a mild level, and there is a hint of black pepper. As advertised, this flavour does end with a slight taste of smokiness. Overall, this rich tasting pulled pork flavour is a great alternative to overly sweet common run of the mill pulled pork. 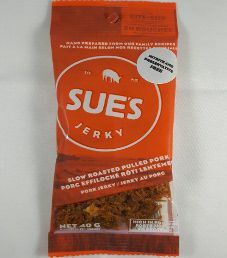 A dozen of these Sue’s Jerky 1.4 ounce/40 gram bags sell online for $47.88. That works out to $2.85 an ounce, which rates as a borderline average price. This pulled pork flavour is certainly recommended to any fan of pulled pork. This non-resealable plastic bag has everything imprinted on to the bag itself, both on the front and back. The Sue’s Jerky logo is a cow between the numbers 19 and 85, meaning Sue start making jerky in 1985. The Sue’s Jerky slogan is “Hand Prepared From Our Family Recipes”. Some facts printed on this bag are “High in Protein”, “Ready To Eat”, “Now in Bite-Size”, and “Nitrate and Preservative Free”. All bag categories are covered with this jerky bag. There are great blurbs printed on the bag about Sue’s Jerky, and this pulled pork flavour. You are encouraged to follow Sue on Twitter, Facebook, and Instagram.